Elegant jars filled with fragrant potpourri to add a touch of glamour to your interiors. 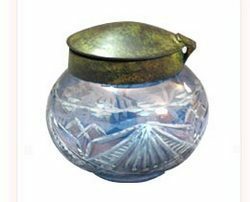 We also manufacture Glass Potpourri Vase that feature nice, vintage and trimmed finish that provides it a distinguished appeal in the market. These Potpourri Vases can be made available in different sizes with rich full color options of your choice. Our team of craftsmen also follow strict quality regime so as to ensure these are free from any defects and attain client's satisfaction. We manufacture Glass Pot Pourri Jar that feature Polyresin Lid and base and perfectly suit the requirements of home decor. These jars are perfect for use in bathrooms and feature finely sculpted finish to give it an exotic look. Here, our expertise lies in offering these in different size and finish specifications as demanded by the customers. 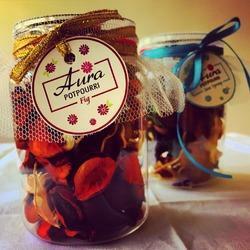 Glass Jar filled with fragranced dried flower petals. Fix it inside your car or wardrobe as a freshener. includes drinking vessels (drinkware) and tableware used to set a table for eating a meal, general glass items such as vases, and glasses used in the catering industry, whether made of glass or plastics (such as polystyrene and polycarbonate). It does not include laboratory glassware.